Every outdoor entertaining area, from lawn to patio, can be cozied up for fall. 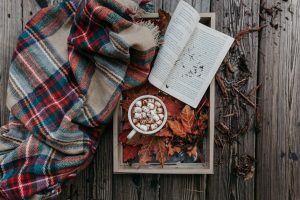 Whether you’re working with an expansive landscape or an intimate balcony, a few small and easy changes can create a warm and comfortable atmosphere for the autumn months. It all comes down to working with the elements and your given space—even though the air gets chillier, an outdoor seating area should be a place to take in the beautiful transition of the seasons. Begin your design by analyzing your given space and existing furniture pieces. What is the size of your patio or lawn, and which layouts best serve an area the promotes flow and conversation? Also, what is the particular weather in your region? Is frequent precipitation common? And lastly, consider how you will most likely use the outdoor seating area on a daily basis. A space to lounge and read speaks to a different design than a spot where guests frequently gather. Cater furniture and accent choices to whether you plan to lounge on your own or frequently welcome guests to your new spot. 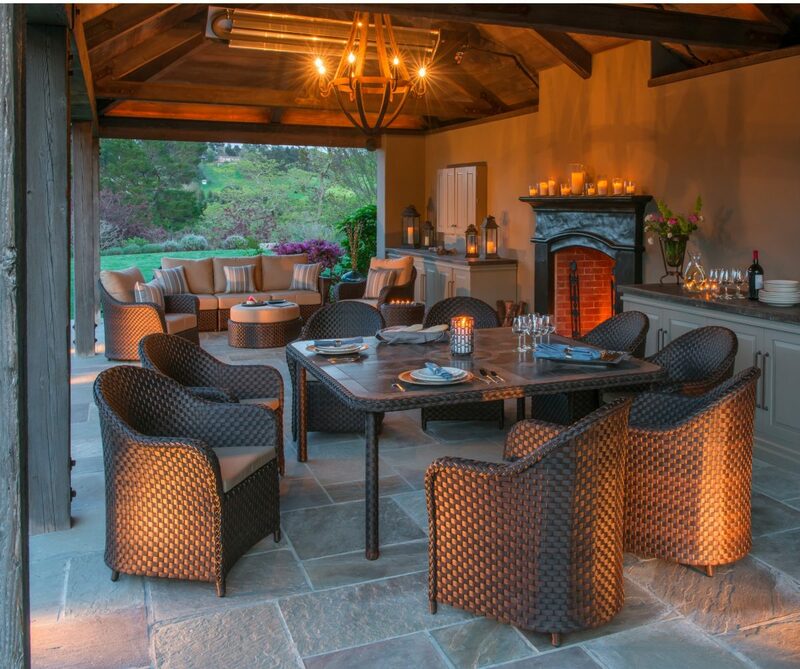 The largest factor to take into account when designing an outdoor space in the fall is warmth and comfort. The temperature’s frequent ups and downs can be hard to stay on top of, and it’s best to be ready for a sudden wave of chilliness as the sun goes down. But furniture can seamlessly switch from summer to fall with just a few accents. Lay thickly knitted throws and pillows onto outdoor chaise lounges and chairs, or tuck extra blankets on the base of side or coffee tables. 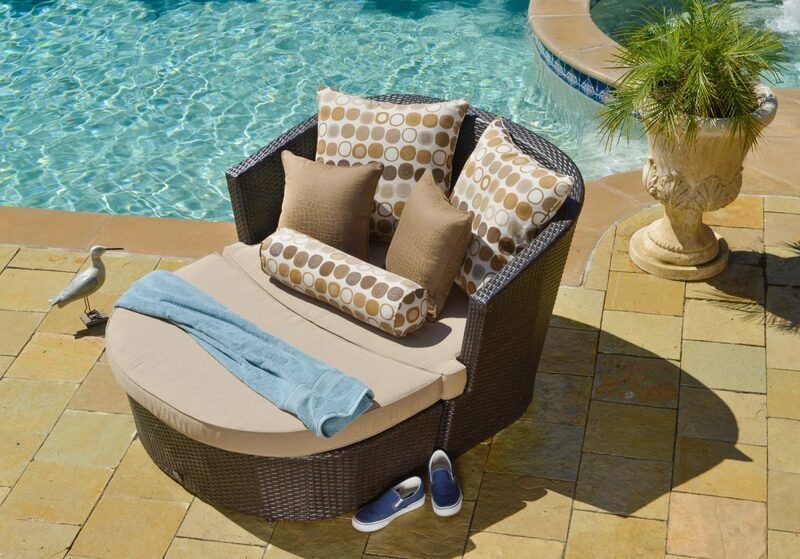 Throw pillows bulk up summer furniture. Consider DIY knitted covers for transitioning summer pillows to cozier fabrics and patterns. 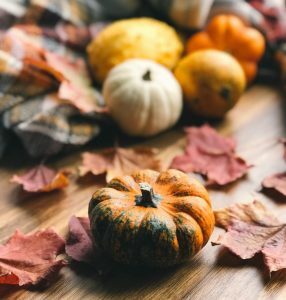 Fall décor items also add festive warmth. Small side boards that hold mugs and tea cozies ready your gathering for hot cups of coffee, tea or hot chocolate. Line the patio floor with indoor/outdoor rugs that stand the test of rainy weather while buffering feet from the cold weather. Most importantly, storing these items closeby both reinvent the space and create ultimate convenience when gathering family and friends. 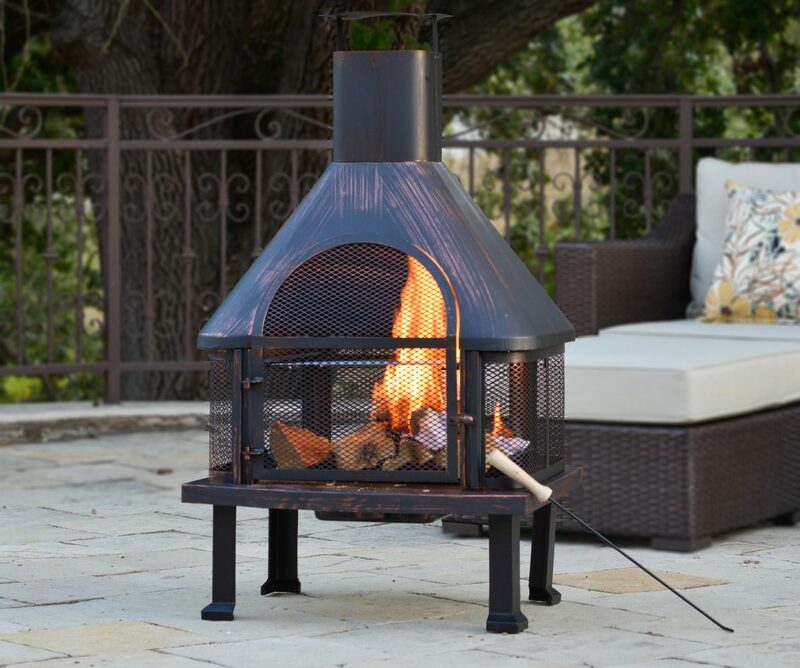 Another exciting way to bring warmth into an outdoor space is to literally create a new heat source. The right outdoor patio furniture or fire pit and fireplace completely transform an outdoor hosting and lounging space in the fall. Outdoor fire pits and fireplaces gather people together, sparking conversation and long nights of catching up that happen only around roaring fire. No matter the size of your space, portable outdoor fire pits to custom-built fireplaces accommodate a whole range of spaces. 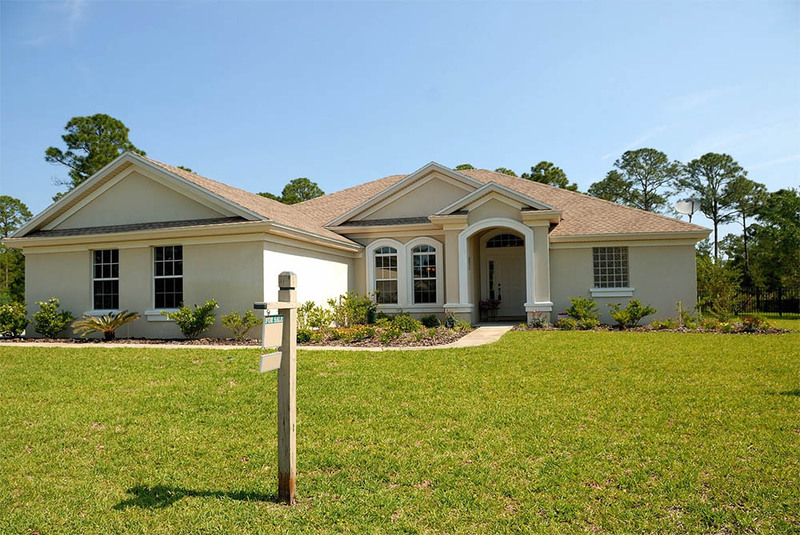 Fire elements also add to the value and overall quality of life in your home. Now that the outdoor space is warm year-round, a new room has been added to the house. Both elaborate and budget-friendly options accommodate this cozy option. Light and scent have a powerful effect on the mind. 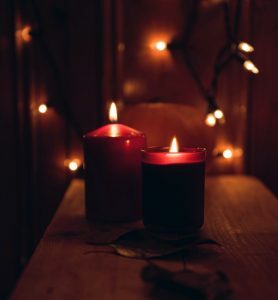 Place scented or multi-sized candles throughout the space to blend the furniture with natural surroundings. The extra light warms up corners of the patio that are darker or cooler than other spots, making sure every seating location is warm and protected. You may also consider built-in or movable outdoor lighting fixtures to add both safety and warmth as you transition from day to night. The perfect balance of lighting changes the energy of a space. String lights of Edison bulbs, for example, add a rustic and playful charm instantly to an area. This will become crucial after the time change at the start of November, but keeps everyone outside longer despite the longer evenings. 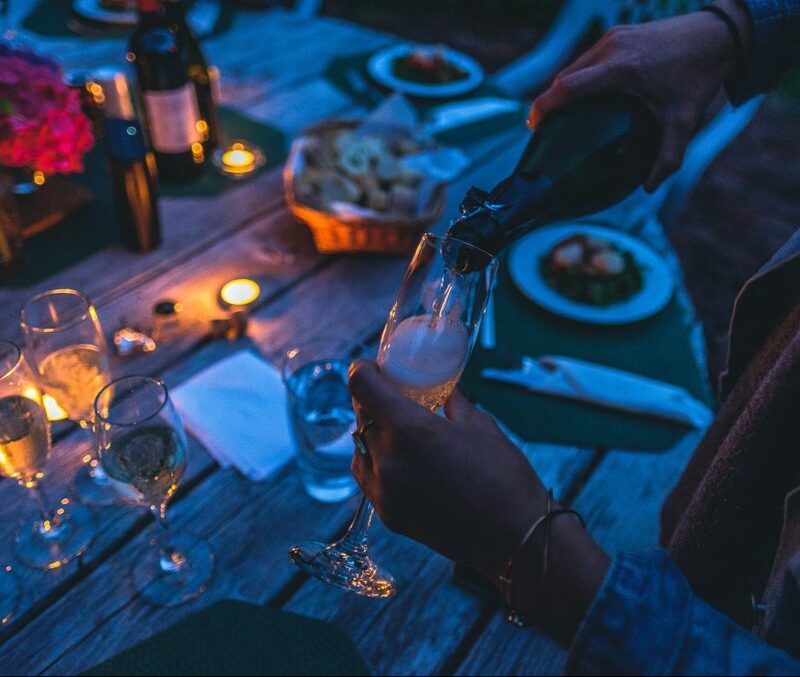 Switch up lighting when throwing a more festive party, adding warmer bulbs or creative lighting projects to your fall outdoor entertaining area. Throw some candles into a natural centerpiece for a focal point as guests dine and gather. A porch or patio is often a genius way to open up your indoor space, extending the hosting and living area to the outdoors. Doing so may entail finding ways to transition items and furnishing from the inside to the outside. On the whole, outdoor furniture differs from the indoor variety, as it must stand up against the elements. So, it’s all about adding bits of comfort and softness to make this tradition more seamless. Creating an extended area outdoors to entertain your guests isn’t too difficult, especially if your home has a designated area with to provide a little shelter with enough space for extra outdoor seating. As stated earlier, accent items such as rugs, throws, and pillows are excellent ways to bring the indoors outside. Leave no piece of potentially chilly floor bare when switching from the house to the porch, welcoming guests out seamlessly on colder days. Add a spot for storing shoes so guests can hop in and outside with ease. As mentioned earlier, lighting also does wonders. In the evening hours, a well-balanced lighting design beckons visitors out to the porch as if it’s an additional room to be enjoyed. Décor works similarly. Fall centerpieces, cozy candles and softer fabric make guests feel as if they are lounging in an extended living room. Make commonly used items accessible, such as books, notebooks, mugs, and glasses in weather-proof containers and storage. This inspires a whole new level of our outdoor living, reminding everyone that these activities can be enjoyed outside as well. The same way textures and colors dictate the energy of an indoor space, warm hues add comfort to an outdoor living area. Stick with warm earth tones—deep greens, oranges, and reds—and focus on thick knits, woven fabrics, and thicker patterns such as plaids. Check out DIY wreath and centerpiece options to create a balanced and personalized space, while incorporating the foliage and beauty that already exists in the nature surrounding the space. Pull from these colors, textures, and energies, the inspiration already exists. No outdoor space requires large swaths of land to entertain or create a lounging spot for you and your family. It’s entirely possible to create a comfortable and classy outdoor entertaining area for your guests with affordable items and pieces and a bit of creativity. It’s all about understanding your unique area and how to blend the transition from the house to the patio. Nature provides the most stunning inspiration, encouraging décor and furnishings that create warmth, comfort and a celebration of the seasonal change.